So here we are only four months away from The VLV Rockabilly Weekender and the Viva Fit Club Facebook Group is SWINGIN'! 356 members and counting! So have you joined up yet? If not, please hop over because we need you! I can't believe how motivating all of you ladies have been for me. With all this time off ahead of us, it's good to have some folks around to keep us on track. Anyway, I'm trying hard to keep up my water intake and my calories down. This part has been difficult for me since I tend to get busy and forget to eat...thus over-eating when the hunger hits. However, I've found that the 'My Fitness Pal' app for Iphone has really helped. It's the easiest thing I've found for keeping an accurate record of caloric intake and calories burned through exercise. It also allows you to follow the progress of your friends and help keep them motivated! So make sure to check that out as an option if you are the type of person who likes to keep a diary of such things. Since the start of the Viva Fit Club, two posts in particular stood to me, donated by other members of the group and greatly appreciated. First, I was intrigued by the recipe for 'Sassy Water', which is supposed to help flatten the belly when you drink it along with a low calorie diet. Here is the recipe as it was posted. You're supposed to drink two liters (!) a day. I haven't started it yet but I have all the ingredients so I think I'm gonna mix up my first batch tonight. Mix together in pitcher and refrigerate over night. Drink 2 liters in a day. Thanks Rachel Davis for this info! Disclaimer: I am not a fitness professional. This is an account of my own attempt at this work out and is not an indicator of what I feel YOU should do. Always consult a professional before beginning this or any other work out routine. ~ 100 Jumping Jacks-This was BY FAR the hardest part of the workout for me. I have always tried to do jumping jacks the right way (as taught by celebrity fitness guru Kendall Hogan) so I end in a squat and try never to bounce. The problems with that is that I was DEAD by 40 jumping jacks. So I took a quick breather and finished in the traditional 'grade school' way, staying lighter on the feet. I was able to finish very winded but alive. ~90 crunches-It's SUPER easy to zone out while you're doing crunches, especially when you do a bunch in a row like this. I mixed up this part by doing 20 full range crunches, 20 oblique twists, 20 bicycles, 20 full range crunches, and then finishing with 20 oblique twists. ~80 squats-That's A LOT of squats. And in other work outs I've done, you don't usually do a bunch of full-range squats in a row. So I mixed this part up by doing 10 slow squats, 10 short range squats, 10 plie squats (toes turned out) until I reached 80. It was'nt bad at all. ~70 leg raises-35 on each leg. Not too difficult. ~60 Jumping Jacks-Significantly easier than 100, let me tell you! ~30 Leg Lifts-15 each leg. Kind of a breeze, by this point. ~ Run for 10 minutes- Since I had the kids around, I couldnt take a run around the block or anything. I ran/jogged in place for 5 minutes and stretched for 5 minutes. 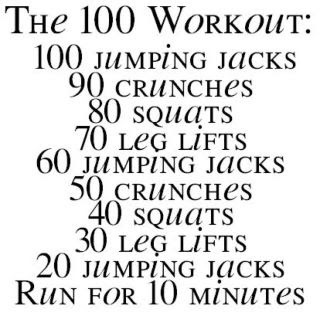 Anyway, this is a great workout and I think it would be excellent for those days you want to get a lot done quickly. I figure by the Fitness Calculator on My Fitness Pal, the calories burned are probably about 235 calories. I entered it as 30 minutes of 'Circuit Training'. Let me know if you feel it qualifies as another category instead? I didnt forget. :) This isnt my own work out...it was from the Prevention website. If you want some AWESOME workouts that you can do at home, you should check out bodyrock.tv ! The workouts can all be scaled to fit your fitness level. You won't be disappointed!